This photograph was taken on December 10, 2017 at 4:15 PM. The location was in the living room of my home in Bethesda, Maryland immediately next to my " Decliner. * "
The "Take It!" came after my having spent decades in being hap hazard in the manner in which I placed pages from the daily newspapers into the paper bag I keep handy at chair side for when I am finished reading them. Having this bag so at the ready has been great for keeping this in a semi orderly state while accumulating enough of them to warrant taking them out to the recycling receptacle which is on wheels for the municipal trash collectors to pick up once a week along with the regular trash. Yes, there is also that favorite other smaller recycling bin for plastic, metal and Bottles - which gets substantial use at my house. The above mentioned bag, has been serving quite well for all this time - but here again, after all these years, it hit me, that by returning the paper to its usual folded state and then take one more step. This step being to take each section or if by chance a page is broken out of a section - and dedicate a few seconds to fold the paper one more time and give the fold a flattening crease. This additional step brings the paper section into a shape that is an almost perfect fit when placed into the mouth of the open, upright, usual shaped grocery store, brown paper bag. With the paper being placed into the bag on it side with it being parallel to the bottom of the bag and gently dropped, it will usually fall and land, still perfectly flat onto the floor of the open bag. By doing this, seemingly inconsequential set of steps, an almost odd order has arrived to what had been an extremely minor blight to this regular function. 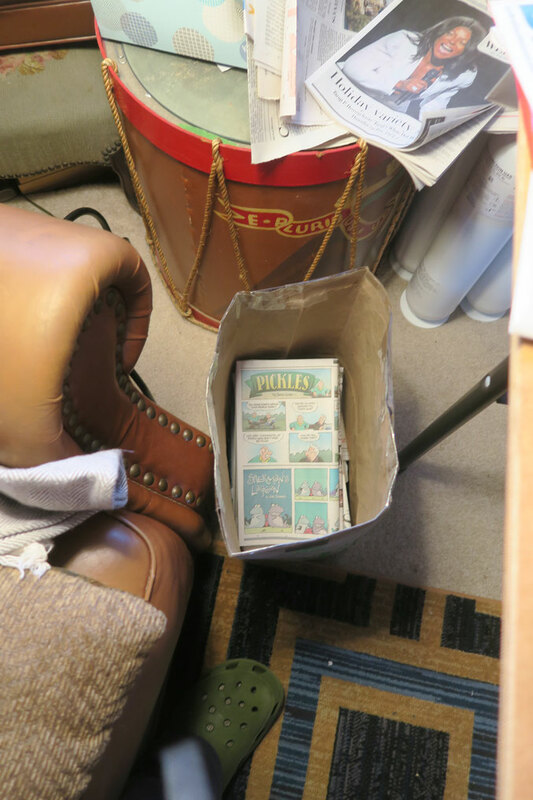 The neat stack of papers accumulates until it reaches a manageable full status, and is taken to the side yard and emptied into the recycling bin. I know this relatively new found " way " may be entirely lost for many, for alas, the ease of getting one's news today, has moved, not quite entirely, to other very convenient sources. So, for those of us, still engaging in this diminished means of getting our news, this may turn out to be a way to have you join me in establishing a little bit of neatness in what otherwise may look like chaos. Taylor has told me there are terms for the levels of cleaning needed when employing a house cleaning service. Things like " regular " and for cases when there is more need to get things into shape, the label of " heavy or deep " is used. I have Islands of order in my house, along with other parts which are ready for me to bring in the detonation folks to bring it around - lolol. My lifestyle is in line to take a big change as am getting ready to conduct project development programs which will be held primarily in the living and dinning rooms. Once the program has fully taken shape, I will have an announcement explaining how it will be presented. Until then, there will be bits and pieces portrayed as the transition takes place. Thank you for joining me in what is soon to be the sixth year of this journey. *I have renamed the recliner I picked up as a used item from the local show room of " Habitat for Humanity " to the new label of " decliner. " I bought the chair as a temporary item, to have, to be able to sleep in, while in the early recovery stages from surgery. Little did I know that it would offer round the clock comfort - to the point of my finding there are times when I " decline " to want to get up, and out of its welcoming grasp. Needless to say, the decliner is here to stay. Decliner, I like that lol. I think I might use that one. Has this site been around for six years already? I think I’ve been around since near the beginning. I’ll have to show this to my dad. He reads the paper every day and occasionally sets aside articles. That’s a much neater way of tossing the paper than my technique. I play a quick game of trashcan basketball after each page. Haha..
That drum looks really familiar, did you share that with us before? Hi Gabe: Yes, it is with thanks that I have found that you are indeed one of the very first to view this experiment. Not only have you been here, but also a very welcomed voice in your comments. For this, the word " grateful ' is an installment descriptor. Thanks for being a stallwart. Hi Teri: Thank you for your offer to show this little bit of convenience to you newspaper reading Dad. I hope he gets a kick out of it - and maybe even puts it to use. A use for even the obtuse is why I have the name, Bruce. Teri, thanks for all of your kind comments through the years. Hi Jim: The sports conversion you make is way more interesting - lol. I trust your rules do not allow " Slam Dunks " nor " Rim Hangs " ( or whatever they are called - lol ) Thanks for your regular contribution of observations and opinions. That you share the site entries with your family is sincerely appreciated. Hi Sally: Thanks for your keen eye and memory. The drum has quite possibly been in a previous site photo. It is one of the support players in a living room full of creativity which sometimes can be justly labeled as " Mayhem " - lol. Until I get a studio - I am referring to my dwelling as the " WhereHouse " lol. There are a multitude of projects underway. Some are taking years to bring to the point where they will be brought to market. Your observations and those of your family which you kindly share are ever so welcome. Thank you. To those others who have made so many wonderful comment contributions.